Why the Hell Is the Space Shuttle Cruising the Gulf Of Mexico Today? 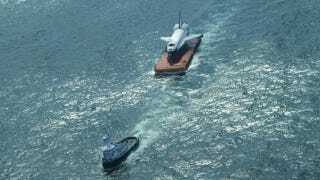 NASA astronaut Gregory H. Johnson and his pal Steve Robinson were flying a T-38 today over the gulf and noticed this weird scene: the space shuttle cruising on board a barge. "Not something you see every day," he says. Indeed!